Poll: Which Carolina Defenseman Is Most Likely To Be Traded? With more reporting today that the Carolina Hurricanes are willing to move one of their defenseman, a debate has emerged over who would be the best target among them. The group is incredibly talented all around, but each player has their strengths and weaknesses. That makes for interesting decisions for both the Hurricanes and any inquiring team over what to prioritize as they look for playoff success. Is offensive skill at a premium in today’s NHL, or is a minute-munching penalty killer more valuable when the games get tighter? Despite most of the trade speculation surrounding Dougie Hamilton and Brett Pesce, we’ll list the basic stats for each of the defensemen currently on the Hurricanes roster below. Cast your vote on who you think will be traded and make sure to explain why in the comments! The Carolina Hurricanes general manager Don Waddell said the team will be bringing in KHL defenseman Michal Cajkovsky to training camp, tweets Chip Alexander of the News & Observer. The 6-foot-4, 236-pound Cajkovsky spent the past two years in the KHL for Yekaterinburg Automobilist, where he posted seven goals and 19 points for the team in 43 games last season. The left-shot defenseman also spent time playing for the Slovakian national team in both the Olympics and in the World Championships. Cajkovsky did spend some time in North America as part of the Washington Capitals organization as he played two years in the ECHL for both the Reading Royals and the South Carolina Stingrays between 2013 and 2015 and was promoted for a 13-game stretch with the AHL’s Hershey Bears in 2015. What Cajkovsky’s chances are to make the Hurricanes is another question. The team is already loaded on the left side of their defense as they already carry Calvin de Haan and Jaccob Slavin for their top-four as well as Trevor van Riemsdyk and Haydn Fleury as two players battling for the final spot on the left side. The team is already deep on the right-side with Dougie Hamilton, Justin Faulk and Brett Pesce. The Buffalo Sabres acquisition of winger Jeff Skinner only suggests to a defeated Buffalo fanbase that the Sabres intend to shake things up and improve on their inability to even reach the playoffs since the 2010-11 season. However, Mike Harrington of the Buffalo News takes it a step further as he suggests that general manager Jason Botterill and the Sabres fleeced the Carolina Hurricanes in their stealing of Skinner and it shows how Buffalo means business. The key to the deal is the fact that Buffalo didn’t give them anything off their current rosters for a top-line left wing. The only player they did hand over will be playing in the NHL next season. Of the picks that Botterill did give to Carolina, the GM didn’t give up one of the three first-rounders that Buffalo has in the 2019 draft. And for Buffalo, Harrington writes, it’s a no-lose for the Sabres. If Skinner signs a long-term deals, they win. If they trade him at the deadline, they should be able to get a similar return than what they paid for him in the first place. The Athletic’s Joe Yerdon writes that there is little movement on a contract for Sabres’ restricted free agent Sam Reinhart. Botterill said the team would be waiting until all arbitration cases are completed, which suggests that Reinhart and his camp wanted to see how everyone did before agreeing to a new deal. Reinhart is coming off a career-high 25 goals and 50 points. In another Yerdon piece, the scribe writes that the Sabres are expecting a lot of development from their defensemen now that they have assistant coach Steve Smith aboard for this upcoming season. The former Carolina Hurricanes’ assistant is well known for working well with young defensemen including Justin Faulk, Brett Pesce, Jaccob Slavin and Noah Hanifin to name a few. He could have a positive affect on a number of players in Buffalo, including Rasmus Dahlin, Rasmus Ristolainen, Nathan Beaulieu, Marco Scandella and Brendan Guhle. Scott Billeck of NBC Sports writes that this will be a big year for high-priced winger Kyle Okposo to prove himself. After suffering through two major concussions over the past two years, the 30-year-old needs a bounce back season after posting just 34 goals over the past two seasons. He’s likely going to start on the team’s second-line next to rookie center Casey Mittelstadt. However, he must show he can stay healthy to even come close to showing he’s worthy of the $6MM AAV he’s carrying for the next five years. With the current high demands from Ottawa in a possible Erik Karlsson trade making it less and less likely that anything will happen, the Tampa Bay Lightning must choose whether they should be content with their defense or need to find another fit. On paper, the team seems more solid than most as the team boasts Victor Hedman, Ryan McDonagh to go with promising Mikhail Sergachev and a host of solid blueline depth, including Anton Stralman, Dan Girardi, Braydon Coburn, Jake Dotchin and Slater Koekkoek. Yet when looking a step further, their elite defensemen are all left-handed. Hedman, McDonaugh and Sergachev are all left-handed, leaving Stralman, Dotchin and Girardi on the right, which isn’t nearly as solid. While Sergachev has proven he can play on the right side, that isn’t ideal for the Lightning, which was another reason why the team was intent on adding the right-handed Karlsson. In a mailbag segment, The Athletic’s Joe Smith (subscription required) suggests the team needs to continue looking for a right-handed defenseman to even out both sides, suggesting the team should monitor the Jacob Trouba situation in Winnipeg since the stud defenseman refuses to sign a long-term deal with the Jets. Trouba, who received a one-year, $5.5MM deal from an arbitrator last week will have to go through the same process next year as he will be a restricted free agent again. If the two sides can’t reach long-term agreement then, he will be an unrestricted free agent in 2020-21 and might force his way out of Winnipeg. Another option, Smith writes, would be prying Justin Faulk away from the Carolina Hurricanes. The right-shot defenseman has two years remaining on his contract at $4.83MM AAV, but with the acquisition of Dougie Hamilton and Calvin de Haan and the plethora of young defensive talent on the roster, including Jaccob Slavin, Brett Pesce, Haydn Fleury and Jake Bean, the team is expected to move Faulk for more help in other areas. One final option and perhaps the cheapest would be to trade for Vancouver Canucks’ Chris Tanev. The 28-year-old stay-at-home defender has been solid for the Canucks, but is being overpaid at $4.45MM for the next two seasons. The right-handed defenseman would be a reliable presence. Regardless, the team needs to shake up their defense. Coburn and Girardi, who have played bigger roles in the past, are better off as third-pairing defenders, while Sergachev played the best hockey of his career during the playoffs, suggesting he’s likely going to move into the top-four. Dotchin and Koekkoek are also both likely going to fight for time in the top-six, so something needs to change. The Carolina Hurricanes, known for their depth and talent on defense, continue to surprisingly add top blue line names to the roster this off-season. After previously trading for right-handed scoring threat Dougie Hamilton, the team has reportedly agreed to a deal with arguably the top defender on the free agent market, left-landed shutdown defenseman Calvin de Haan. The Raleigh News & Observer’s Luck DeCock first reported that the team has signed de Haan to a four-year, $18.2MM contract – a $4.55MM AAV. The team confirmed the deal soon after. De Haan, 27, was No. 9 on PHR’s Top 50 Free Agents List. Although he missed the majority of last season due to injury, de Haan has shown a high-end defensive ability in his pro career. The 12th overall pick in 2009 by the New York Islanders, de Haan has proven to be one of the best shot blockers in the NHL and an extremely reliable presence on the back end. Yet has has also improved his offensive production with each year, including a career-best scoring rate prior to his injury last season. While many may have balked at a $4.55MM value for de Haan in a vacuum, he is clearly superior to nearly every other defenseman in this free agent market. Carolina is a surprise landing spot for the defensive standout though. 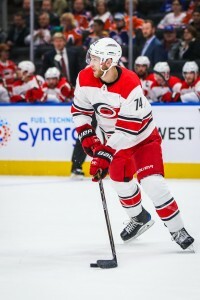 De Haan’s arrival in Raleigh will only add to a formidable corps of rearguards that includes Hamilton, Justin Faulk, Jaccob Slavin, Brett Pesce, Trevor van Riemsdyk (an RFA), young pros Haydn Fleury and Roland McKeown, and elite prospects Jake Bean, Luke Martin, and Adam Fox. De Haan’s signing very well could be a sign of more changes coming in Carolina under new ownership and new GM Don Waddell. Poll: Who Should Be The Carolina Hurricanes Captain? Yesterday when the Carolina Hurricanes announced Rod Brind’Amour as the team’s next head coach, one of the first questions he answered was if the team would continue to employ two “co-captains” in 2018-19. The Hurricanes allowed Jordan Staal and Justin Faulk to share the duties this season, while Jeff Skinner was named an alternate. Brind’Amour made it clear that there will be just one, and that he already has an idea who will be his team’s captain, but will talk to the leadership group before making that decision public. He should have a pretty good idea of the dynamic inside the dressing room, after serving as an assistant coach for the last seven seasons. Staal and Faulk remain the obvious candidates, but it’s not a guarantee that Brind’Amour will give it to one of them. Justin Williams is the elder statesman on the club and was brought in for his steady performance and experience in the playoffs. Williams has won three Stanley Cups in his career, including Carolina’s only championship in 2006. Jaccob Slavin though only 24 years old, logged the most ice time on the team each of the past two years and is signed longer than anyone else on the team. He’ll start into his seven-year extension next year, and is a steadying presence on the blue line. Skinner himself is an option, though there are rumors of a potential exit from Carolina this summer if a trade can be found. The 25-year old sniper is scheduled to become an unrestricted free agent in the summer of 2019, and has garnered plenty of interest from around the league. Who should be named captain for the team? Is there a chance that the eventual captain isn’t even on the roster yet? Cast your vote below and make sure to leave your thoughts in the comments. After a double-overtime thriller in which the Vegas Golden Knights took a 2-0 lead in their first-round series with the Los Angeles Kings, the San Jose Sharks will attempt to take a 2-0 lead of their own tonight against the Anaheim Ducks. The Sharks, who picked up a 3-0 victory Thursday on the road, got a surprise during pre-game warmups when injured veteran center Joe Thornton participated in the pre-game skate before Thursday’s game. According to Paul Gackle of the Mercury News, Thornton is close to returning to the team, but isn’t yet ready. Thornton, who went down in January with a torn MCL injury, has been rehabbing for the past 11 weeks, but has said that unlike last year when he returned from a knee injury after just two weeks for the playoff run, he intends to make sure he isn’t a distraction to the team before returning. However, the more wins that the Sharks can pick up in the meantime can buy time until Thornton believes he is fully healthy and ready to return to the lineup. Jim Matheson of the Edmonton Journal writes that the Edmonton Oilers are desperate to repair their defense and wants to trade for a top-line defenseman. While he suggests the team could offer up its lottery pick in a deal to get Arizona’s Oliver Ekman-Larsson or work out some type of deal to get Colorado’s Tyson Barrie, neither is realistic. The team’s best chance at solving their defensive issues is right-handed shot Justin Faulk from the Carolina Hurricanes. The 26-year-old is falling down the Hurricanes’ depth charts with the emergence of younger defensemen like Jaccob Slavin and Brett Pesce. Faulk would also fix their logjam of left-handed defenseman as several defenseman such as Andrej Sekera and Kris Russell are left-handed, but playing on the right side. The problem is that Carolina wants a forward back. So who are they going to send? Matheson, in the same article, adds that the Oilers have no intention of trading Ryan Nugent-Hopkins, who might be their best trade chip. The center was rumored to be a trade candidate with his high salary ($6MM AAV) over the next three years. However, the team believes he might be the perfect linemate for Connor McDavid as a wing, which would move youngster Ryan Strome to the third-line center position. Nugent-Hopkins is coming off a season where he tied his career-high in goals with 24 (and he missed 20 games this season). The Carolina Hurricanes still have a shot at making the playoffs. Well, Sports Club Stats gives them a 0.2% chance of making it anyway. However, those already-minuscule odds are now almost certainly gone. The team announced this afternoon that two key players, defenseman Brett Pesce and center Victor Rask, have been shut down for the season due to shoulder injuries. Without Pesce and Rask, any semblance of hope that Carolina fans had of ending their league-worst postseason drought this year has evaporated. Pesce, 23, is part of the Hurricanes’ dominant top pair alongside Jaccob Slavin and one of the main reasons why the team allows the fewest shots against in the NHL. Rask, 25, has 31 points and an even rating (anything non-negative is an outlier among ’Canes players this season) and leaves a team that is already shallow down the middle with even fewer options. In response to this announcement, the team has recalled young defenseman Roland McKeown from the AHL’s Charlotte Checkers. McKeown may be relied on to play a top-six role for the remainder of the year and, if he is successful, could further the narrative that the time has come for the Hurricanes to trade one of their top blue liners. It is likely the first of many call-up’s down the stretch to test out young players in game action ahead of the off-season. Expect the likes of Aleksi Saarela, Janne Kuokkanen, Julien Gauthier, Warren Foegele, and Alex Nedeljkovic to be among the names given a promotion in the coming weeks. The Carolina Hurricanes are by no means out of the playoff hunt. Afterall, they have won two in a row and currently are clinging to the second and final wildcard spot in the Eastern Conference. However, the team might end up being sellers at the trade deadline as the young team have quite a few trade chips that could help this team down the road, according to The Athletic’s Eric Duhatschek (subscription required). The scribe writes that the Hurricanes have quite a bit of depth on the blueline and it should get deeper soon. The team already has captain Justin Faulk leading the defense and although he’s not having as good of a campaign as a year ago, he might make for a good trade chip especially as the defensive salary cap will rise for the team next season. Carolina already have Jaccob Slavin and Brett Pesce under contract and both their extensions will kick in next year at a combined $9.325MM. Defenseman Noah Hanifin will be a restricted free agent next year and should get a solid raise. The team has rookie Haydn Fleury back next year and likely will have 2016 first-rounder Jake Bean coming in. This might be the right time to make a move for a scoring forward. Duhatschek also notes that the team, who recently waived Marcus Kruger and Josh Jooris, could also look to move another pair of veterans at the deadline including Derek Ryan and Lee Stempniak. Ryan is an excellent face-off specialist and would make a solid bottom-six center and is an excellent story, while Stempniak, is starting to find his groove after missing much of the season. Ryan has 11 goals and 26 points this season, while Stempniak has played in just 14 games, but has one goal and five assists so far. The New York Post’s Larry Brooks writes that New York Rangers winger Rick Nash has set his 12-team trade approved list and the veteran revealed that he chose teams based on their chances to win the Stanley Cup this season. “I included the teams that I think have the best chance of winning the Stanley Cup and are also places I think would be good for my family,” the 33-year-old father of two young children said. “And, yes, that does include teams in Canada. I’m not excluding that as a possibility.” Nash says he would consider changing the list if a certain team not on the list shows interest in him. Brooks adds that several teams have shown interest including the Dallas Stars, Nashville Predators, San Jose Sharks, St. Louis Blues, Boston Bruins, Winnipeg Jets, Tampa Bay Lightning and possibly the Toronto Maple Leafs. Brooks also notes that the Tampa Bay Lightning have quite a bit of interest in adding defenseman Ryan McDonagh at the trade deadline. They believe that with Victor Hedman and McDonagh at the blueline, the chances Tampa Bay could win a Stanley Cup would increase heavily. However, the scribe notes that the Rangers should demand 19-year-old defensive rookie Mikhail Sergachev as the asking price for the veteran defenseman. The Toronto Maple Leafs have gotten some interest in veteran forward James van Riemsdyk recently, Sportsnet’s Mike Johnston said during Saturday’s Headlines’ segment on Hockey Night in Canada. Johnston said two teams were told they have no plans to trade van Riemsdyk before the deadline. The 28-year-old goal scorer, who has 22 goals so far this year, will be an unrestricted free agent this year, but according to Johnston, has not received any contract extension offers yet. Sportsnet’s Nick Kypreos added on the segment that the main reason is because van Riemsdyk refuses to take a hometown discount. As the holiday season approaches, PHR will look at what teams are thankful for as the season nears the quarter point of completion. There also might be a few things your team would like down the road. We take a look at what’s gone well in the first month and what could improve as the season rolls on. What are the Carolina Hurricanes most thankful for? In 2016, the Hurricanes happily took Bryan Bickell’s $4MM cap hit off the books of the Chicago Blackhawks after the latter were knocked out of the playoffs in the first round. Chicago had once again added at the deadline, but were unable to repeat as Stanley Cup Champions. Now, with Toews and Kane signed to identical eight-year, $84MM contracts the team had to shed money once again from somewhere on the roster. Bickell was the easy target as the next cap victim, despite his playoff heroism a few years earlier. In order to get Carolina to bite though, the Blackhawks had to include Teuvo Teravainen in the deal. Teravainen, the 18th-overall pick in 2012 was coming off his first full season in the NHL and a solid-if-unspectacular 35 points. The young forward was heading into the last year of his entry-level deal and would eventually need a raise of his own. After one season in Carolina, Teravainen has turned into a key member of their offense and a point-per-game player through the early going. With 19 points this season he leads a young and upward-trending hockey club, doing their best to compete in the Metropolitan. He looks certain to set career-highs in nearly every offensive category, and will be an important piece going forward for the Hurricanes. Who are the Hurricanes most thankful for? Jaccob Slavin and Brett Pesce. The Hurricanes aren’t Stanley Cup contenders just yet. There’s no telling how soon it could happen, but it almost certainly will if their current trajectory continues. So much of that success will be based around their incredibly deep defense corps, and how well Slavin and Pesce have progressed. Selected in the third and fourth rounds, the two young defenders have become legitimate top pairing options for the Hurricanes at the tender age of 23. The fact that Carolina can play them for more than a third of the game (23:53 and 21:38 respectively) could make them players at the deadline. With a pipeline of young defenders in Noah Hanifin, Haydn Fleury, Jake Bean, and Roland McKeown, and a pair of not-so-old veterans in Justin Faulk (25) and Trevor van Riemsdyk (26) the team could be the biggest supplier of defense at the trade deadline should they so choose. That choice is made a lot easier when you have a pair of horses already on the roster at such a young age. Slavin and Pesce are anything but household names, but they darn well should be. What would the Hurricanes be even more thankful for? Scott Darling was brought in this summer to be the answer in net for the Hurricanes, and immediately given a four-year contract. He was coming off an incredible season as the backup to Corey Crawford, and carried a .923 save percentage in three years with Chicago. That number has dropped significantly this season, and Darling has struggled to provide Carolina with anything but the same uninspiring goaltending they’ve had the last several seasons. It’s not exactly that Darling has played badly, just that he hasn’t been able to take the team to the next level. Cam Ward has played quite well in a backup role, but is well past his starting prime in the NHL. If Darling could get a bit closer to the level he showed in Chicago, the Hurricanes would be a dangerous playoff team. Otherwise, it’ll be much of the same middle-ground for the club. What should be on the Hurricanes’ Holiday Wish List? The Hurricanes have a glut of young talent, but lack some punch offensively and on the powerplay. Their man-advantage numbers rank 27th in the league, and a dynamic forward could do a lot to help that. While a center would likely fit better into their current roster they could also make room for a winger if that’s all that was available. Victor Rask has been a real disappointment this season offensively, and though he could obviously help by getting back to his former self the team could do well with a real star up front. Evander Kane, James van Riemsdyk and James Neal would all be interesting rentals for the Hurricanes, if they decide to sacrifice some future assets for a shot at the postseason this year. While they all seem like long-shots at this point, a few more months of hanging around in the Metro could inspire GM Ron Francis to do something splashy.